Anyone interested in visiting DOMOTEX this coming January may want to check out the show’s highlights on the DOMOTEX website. I have summarized a few of them here to whet your appetite! Please ask us about our U.S. delegation now forming. 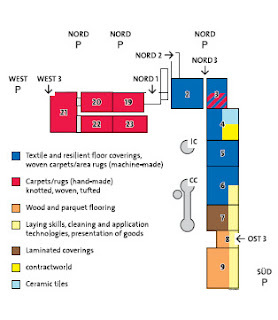 Compared with virtually any other trade show, DOMOTEX HANNOVER is an extremely international event. For example, 80 percent of the exhibitors come from outside the host nation. Exhibitors from some sixty countries come to Hannover to conclude business deals and make new contacts. Germany is represented by the largest contingent of exhibitors, followed by Belgium, Turkey, India, the Netherlands, China, Italy and Switzerland. The U.S. is represented by over 30 exhibitors this year. There is no more attractive venue for top international decision-makers. In fact, 70 percent of all the trade visitors attending DOMOTEX 2009 came from senior management. The display category “hand-made carpets” will be shown for the first time in the exhibition halls at the northern end of the Exhibition Grounds [in red on the image to the left]. These halls can be accessed directly from the main entrance Nord 1, an entrance used by large numbers of visitors. Ample parking is located adjacent to these halls plus they are well connected to the Hannover public transportation network. The new location makes it easier for trade visitors to find the individual keynote displays. Roofed walkways make the trip between halls provides shelter from the winter weather. The new halls presents a much better delineation of the full range of hand made types and styles and a convenient lounge offers a great place for business meetings and social interaction. 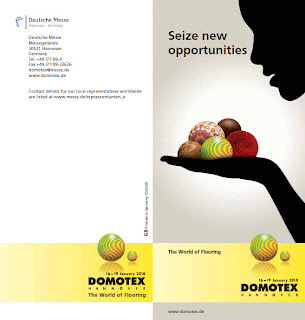 Here is a link to the DOMOTEX 2010 Visitor Brochure [which includes the hall plan graphic]. I’ll be sharing more highlights over the next weeks, but don’t hesitate to contact the U.S. office anytime for assistance. While you are in Hannover, take some time out to visit the city. Follow this link to the cultural scene.